Stunning converted 2 bedroom self catering gite with pellet burner and all mod cons, sleeps 5 (Max 4 adults - this property does not have a bed settee). Fully equipped kitchen with washing machine, dishwasher, microwave and fridge freezer. Master bedroom with king size bed, second bedroom with 2 or 3 singles; or can be made up into a second king size bed. Fully pet friendly. Above ground swimming pool. All bedding, towels, tea towels etc are provided. 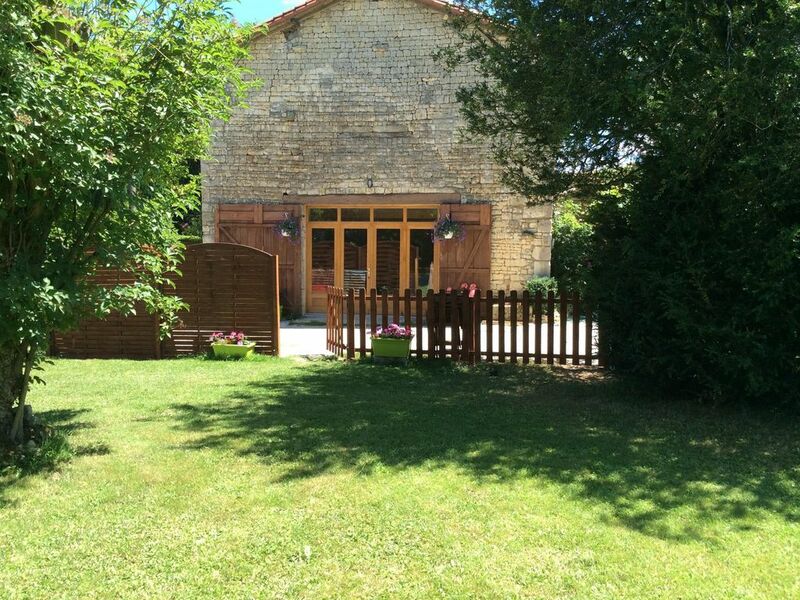 Gite is fully fenced with its own garden affording privacy to the outside eating area. Gas BBQ available on request. Guests should be aware that we are in a quiet hamlet surrounded by wildlife and are 5 minutes drive from the nearest shop / bar. Pellet burner heats whole gite. 200+ dvds available to borrow. Home from home property. Everything you require for a relaxing break. Gite well equipped,very clean and spacious. We loved our property, clean , airy , lots of room for my family , we felt very comfortable in our Gite . Thank you! We loved having you and hope you will come again. The property had everything we needed and is fitted out to a high standard. Pru and Paul were close by if needed and are useful sources of local information, but we didn't know they were there most of the time. They have a wonderful friendly dog Honey who could often be seen scampering around. There are plenty of delightful towns and villages around dotted along the banks of the nearby Charente river, more adventurous folk could try kayaking we preferred long lunches at the many restaurants close to the river. All in all we had a bloody wonderful, relaxing time. This is a very good place to stay. Wir haben hier einen schönen Urlaub verbracht. Die Vermieter sind sehr freundlich und hilfsbereit, das Häuschen mit allem ausgestattet, was man braucht. Lediglich der Pool könnte größer sein. Woning is van alle gemakken voorzien. Een hordeur zou wel praktisch zijn, gezien de vele vliegen (in juli). In de directe omgeving is weinig te doen; kust op ca 2 uur rijden (Saint Martin op Il de Ré is een aanrader). Oradour sur Glane (op ca 1,5 uur) zeer indrukwekkend. Leuke, oude steden zijn Niort en Angouleme (vanaf 45min). Grote supermarkt op ca 5 min rijden. Huiseigenaren zeer gastvrij en behulpzaam. Gezien de afgelegen ligging voor ons (gezin met 2 pubers), niet voor herhaling vatbaar.